If you are a fan of Melissa McCarthy then you might want to at least rent this film. I don't like Melissa McCarthy. I personally never found her funny. Her latest attempt at humor, Tammy, did not change my mind at all. In fact it only solidified the idea that I will go out of my way not to watch her films. Picture if you will a remake of Thelma and Louise, without Gina Davis, dumb downed to the lowest level of jokes possible like "poom" (which I still don't how that is funny) ,and made to drag on with no soul or care about the characters. You then have the film Tammy. However, that is not saying Tammy is not without a star-studded cast. Aside from the abysmal Melissa McCarthy (Heat, Bridesmaids) it also stars Susan Sarandon (Thelma and Louise, Dead Man Walking), Allison Janney (West Wing, American Beauty), Gary Cole (Office Space, Pineapple Express), Mark Duplass (Zero Dark Thirty, Lazarus), Kathy Bates (Fried Green Tomatoes, Misery), and Dan Aykroyd (Ghostbusters, The Blues Brothers). It begs the question why such amazing actors and actresses took part in this film. Did they need the money that badly? The only performance that stood out in my mind was that of Kathy Bates. Every time she was on screen she easily took the limelight from McCarthy. The film is directed and co-written by Melissa McCarthy ‘s husband Ben Falcone in his directorial debut and hopefully his last as well. I think he was so blinded by his love that he didn't put his best foot forward. The pacing was extremely slow and the picture just didn't have any heart. It seems like he was just going through the motions of making a film, just because his wife was the lead and they produced the film as well. Possibly if a more seasoned and skilled director was at the reigns this film could have turned out a lot different. As with most recent releases the picture and audio quality are excellent. The picture presented in 1080p/AVC-encoded video is well done. While it doesn't really "jump" out of the screen, this mostly can be blamed on the cinematographer and director for horrible shot selections. The audio presented in DTS-HD 5.1 does a good job delivering the audio, but again didn't have much to work with since the audio department on the film didn't make any good decisions with background sounds. 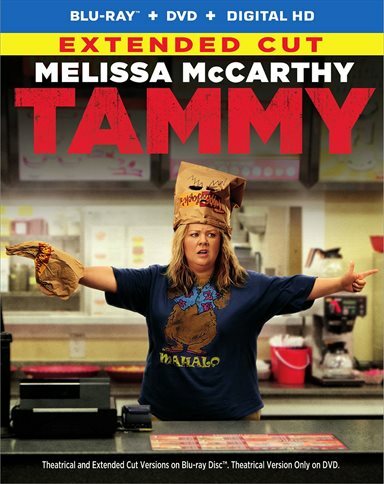 The Blu-ray contains both the theatrical and extended cut of Tammy. Aside from the digital copy this is very bare bones release. A five minute talk with McCarthy and husband talking about taking a road trip, Gag reel, Deleted scenes, and really "unfunny" set of extra entitled "Fun Extras" which just has McCarthy repeating the same scenes in the film again and again that I found boring the first time. If you are a fan of Melissa McCarthy then you might want to at least rent this film, if you are a casual fan or only found her funny in Bridesmaids I suggest you pass on this film, and keep that hour and half of your life to do something more productive, such as watching paint dry. Download Tammy from the iTunes Store in Digial HD. For more information about Tammy visit the FlickDirect Movie Database.